Here’s what’s up in the world of TV for Wednesday, July 17. All times are Eastern. 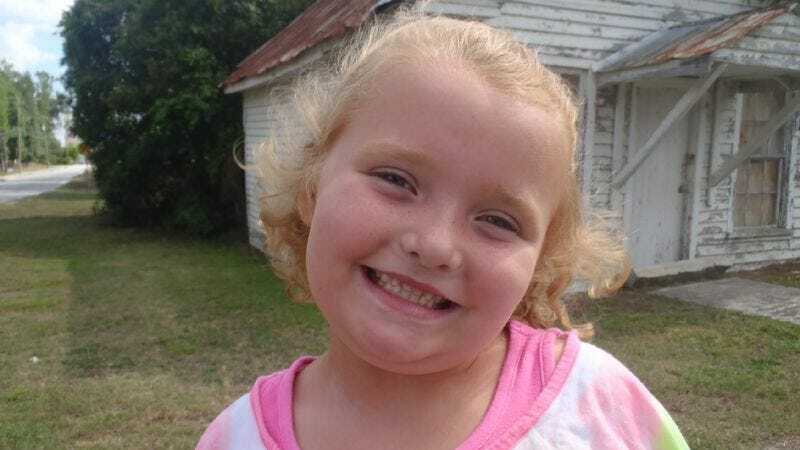 Here Comes Honey Boo Boo (TLC, 8 p.m.): We hate to enable the pork-chop-casserole that is Here Comes Honey Boo Boo, but we would be remiss if we didn’t point out that the second season première of this reality show is accompanied by a “Watch ’n Sniff” event. Viewers lucky (or unlucky) enough to snag a scent card (which were distributed through July issues of People magazine and US Weekly) will be able to scratch n’ sniff six scents that correspond to scenes throughout the episode. Between the child exploitation and the Willy Wonka-esque sniffing cards, we’re officially just one Arena short of becoming The Hunger Games’ Capitol. Arrested Development (Netflix, 11 a.m.): Noel Murray and Erik Adams dive into the penultimate (and antepenultimate) episodes of the show’s fourth season in which young-adult George-Michael and actual adult Buster try to become, well, adults. MasterChef (Fox, 9 p.m.): The chefs compete in a canned-vs-fresh elimination challenge. If years of watching Chopped have taught us anything about reality cooking shows, it’s that the judges can always, always tell when something comes from a can. That’s why Phil Dyess-Nugent insists on using only homemade Spam in his own cooking. The Bridge (FX, 10 p.m.): Molly Eichel begins her regular coverage as Marco and Sonya continue investigating the bodies found on the bridge. Seeing as the show also features Scooby-Doo star Matthew Lillard, we can only assume the murders were committed by Old Man Jenkins. And he would have gotten away with it too, if it weren’t for those darn multi-cultural detectives! Futurama (Comedy Central, 10 p.m.): George Takei and basketball legend Larry Bird lend their voices as the gang are transported into a trio of Saturday morning cartoons. Scooby-Doo and G.I. Joe are two of the worlds being spoofed, but Dennis Perkins is most excited about the Strawberry Shortcake-inspired segment. Freaks And Geeks (1 p.m.): Nick tries to take his relationship with Lindsay to the next level with the help of Styx’s “Lady.” Todd VanDerWerff recommends using Whitesnake’s “Is This Love?” (and the accompanying music video) when trying to seduce a lady. ESPY Awards (ESPN, 9 p.m.): America does very little to acknowledge the heroic efforts of athletes so it’s always nice to see an event honoring the brave men and women who play games for a living. Jon Hamm hosts the 21st ESPY Awards, the one time of year athletes can be honored for their work by winning something. Mystery Diners (Food Network, 10 p.m.): In this fourth season première, the Mystery Diners team visits Buster’s Beach House in Long Beach. Now all we can think about is what it would be like if Buster Bluth owned a restaurant: juice boxes, seals, and banners galore (look at banner, diners!). Deal With It (TBS, 10:30 p.m.): In this new Howie Mandel-produced hidden camera show “average” people pull pranks on their friends with the help of guest celebrities. We’d rather not deal with it, actually. The Breakfast Club (AMC, 10 p.m.): Don’t you forget about this classic John Hughes film about a “criminal,” an “athlete,” a “brain,” a “basket case,” and a “princess” who are forced to spend a Saturday in detention. We’d like to say this film speaks to all kinds of high school experiences, but let’s face it, the only people who work at The A.V. Club were “brains” in high school so we have no idea if Hughes got the other stuff right. Seven Faces Of Dr. Lao (TCM, 8 p.m.): This 1964 film stars Tony Randall as a 7,000-year-old Chinese man who runs a magical circus that comes to visit a small town in Arizona. He also keeps the Loch Ness Monster in a fishbowl. Circuses, magic, and monsters? What’s not to love?! Oh right, the casual racism of casting Tony Randall as a Chinese man. Whose Line Is It Anyway? : Anticipation for the return of this beloved improv-comedy show was sky high. Ryan McGee reassures us that the rules are still made up and the points still don’t matter.